Anyway, for electric cars, there is no tax. Moreover, if you take it as a company car (I have my own consulting company), the assessed benefit is only half of what it would be for a regular car (or even a hybrid.) Moreover, you can park for free in Oslo, drive in bus lanes, get a free E-Z-Pass (i.e., the Oslo equivalent), there are free charging stations around and there is no annual road tax. Electric energy is clean and plentiful in Norway. The upshot is that this great GT car will cost me just a little bit more per year than our 12 year old Toyota. In short, a no-brainer. 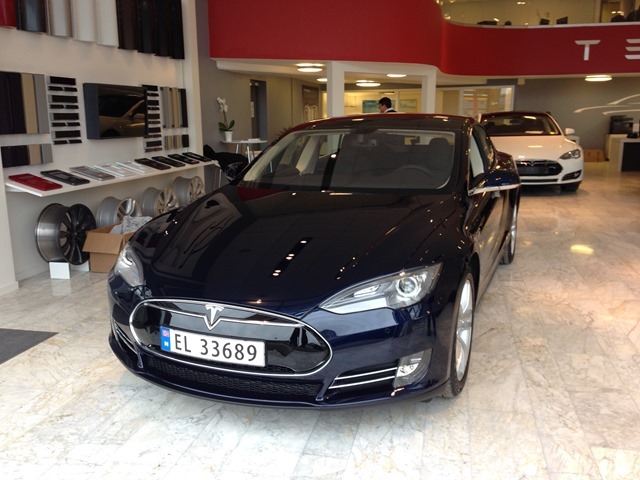 The Tesla S is a very cheap car in Norway, and consequently, Norway is the second largest market in the world for it. The dealer told me they were taking delivery of almost one thousand of them only in March. It drives wonderfully, as Cringely says. After having driven it for a few days I have a permanent grin on my face. The effect is similar to driving my veteran Mercedes 6.9 – smooth and effortless power and comfort – but without the $2/mile fuel cost. In fact, driving the Tesla 100 km (60 miles) costs around $2.30 in electricity if I charge it at home, which is quite manageable, thank you very much. Now I make up excuses to drive somewhere, and constantly have to watch the speedometer, since there is no motor noise to help you estimate the speed. But I am not suffering at all at the moment. Instead, I am looking forward to tomorrow when my wife, perhaps, will not need the car and I’ll get to drive it. If you need a Toyota and a Mercedes or two, just send me an email…. This entry was posted in Nerdy ruminations, Relax a bit, Up close and personal on March 20, 2014 by Espen. No blog post since May 4… Well, my excuse is that a) I got sick for a couple weeks, which has slowed things down, and b) I then embarked on a 3-week teaching/speaking/travelling marathon that consumed all time, was very interesting and will earn me an SAS Gold card as soon as the points get processed. Over the last three weeks, I have taught a four-day executive EMBA class at BI, two full-day PCL sessions for Harvard Business Publishing (at ESSEC in Paris and ESADE in Barcelona, both very enjoyable), participated in two oral exams, given presentations and facilitated sessions in a few companies that shall remain nameless, and held a session on technology tools for teaching for my colleagues. One more whole-day session to go, and then summer can begin. For various reasons I have been working from home almost the whole semester, acquiring the odd hours and sloppy clothing habits of a hermit scribe (except when videoconferencing, where a hastily added shirt and some clever camera positioning is required). 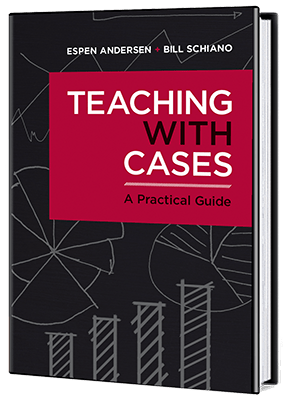 You can get very addicted to your cluttered home office and the view from the front window – and find that tutoring students over Skype is, if anything, more efficient than being in the office. It only takes me 30-45 minutes to get to work (car, bus or bicycle) but I have begun to see the 1.5 hours wasted as an unbearable intrusion on my productivity. But you do find that there are wide discrepancies in people’s attitude to video- and teleconferencing. Consultants, engineers and some academics barely bat an eyebrow when I suggest Skype. Others – including some foreign clients – absolutely insist that I have to be there in person, even for fairly routine matters. Some official meeting don’t do teleconferencing, for some reason. And don’t get me started on the bureaucratic hassles of various exam-, medical and visa-related matters, which apparently were designed for parchment, quill pens and post diligences. There is progress. After some hiccups my SAS app worked beautifully, meaning that paper boarding passes and check-in lines (even at machines) is a thing of the past. I relearned where the lounge is at Arlanda airport. I rediscovered my system for where to store things so I don’t forget them, and started feeling like a flying consultant again. And for three weeks, it was rather fun. Now I am happy to go back to the reclusive hermit style. Ahhhh…where was that white wine again? This entry was posted in Up close and personal on June 21, 2013 by Espen.